What is the Arizona Monsoon? In Arizona, as in other regions of the world including India and Thailand, we experience a monsoon, a season of high temperatures, high winds, and high moisture, resulting in potentially deadly weather. The term "monsoon" comes from the Arabic "mausim" meaning "season" or "wind shift." Up until 2008 Arizona's monsoon varied from year to year in starting date and duration. The Arizona monsoon officially began after the third consecutive day of dew points above 55 degrees. On average this occurred around July 7 with the monsoon continuing for the next two months. In 2008 the National Weather Service decided to take the guesswork out of monsoon start and end dates. From now on June 15 will be the first day of the monsoon, and September 30 will be the last day. They did this simply to take the focus off whether or not a storm was considered a monsoon storm or not, and have people be more concerned with safety. Monsoon storms range from minor dust storms to violent thunderstorms. They can even spawn tornadoes, though that is very rare. Typically, Arizona monsoon storms start with heavy winds sometimes resulting in a visible wall of dust hundreds of feet high moving across the Valley. These dust storms are normally accompanied by frequent thunder and lightning often leading to heavy downpours. Monsoon rains average about 2-1/2", about 1/3 of our yearly rainfall. Is There Damage During Monsoon Storms? Serious damage can occur from high winds, or from debris being tossed by those high winds. It is not unusual for trees to be downed, power lines to be damaged, and roof damage to occur. As you might imagine, homes that are not as sturdy, like some manufactured homes, are more susceptible to wind damage. Power outages for short periods of time are not uncommon. When such high volume rain descends upon the Valley of the Sun, the ground and most especially the surface streets flood. Most roads in the area are not built to drain water quickly since such rain is too rare to justify the extra costs involved in constructing an elaborate drainage system. Quite often the rain pools on streets during and for a few hours after monsoon storms causing dangerous driving conditions. The worst areas for flooding are the many washes in the area, small gullies where heavy rains drained off the land long before roads were built through them. That's where drivers will normally encounter signs cautioning against crossing the road when flooded. It may seem strange to have signs like like the one on the right posted in the middle of the desert, but they do serve a practical purpose. Those signs should be heeded carefully. Even if the water rushing across the road looks only an inch or two deep, it may very well be so deep that vehicles, including high clearance trucks, stall and get stuck in the wash. Firefighters and other rescue workers generally have to be called in to rescue motorists stuck in washes before their vehicles are covered by the unexpected deep runoff. Those rescuers are usually accompanied by television news helicopters capturing the rescue on videotape to be broadcast, sometimes live, as a warning to others. That's only the beginning of the humiliation trapped drivers face. In Arizona, under the so-called "Stupid Motorist Law", municipalities and rescue agencies can charge people for the cost of being rescued if they fail to observe posted warnings. The word "monsoon" refers to a season by definition, and should not really be used with the word "season." In addition, meteorologists don't use the plural of the word monsoon. Although there are dictionaries that indicate that the plural of "monsoon" is "monsoons" the following is the proper rule. Not best: The monsoons arrive every summer. Best: The monsoon thunderstorms arrive every summer. 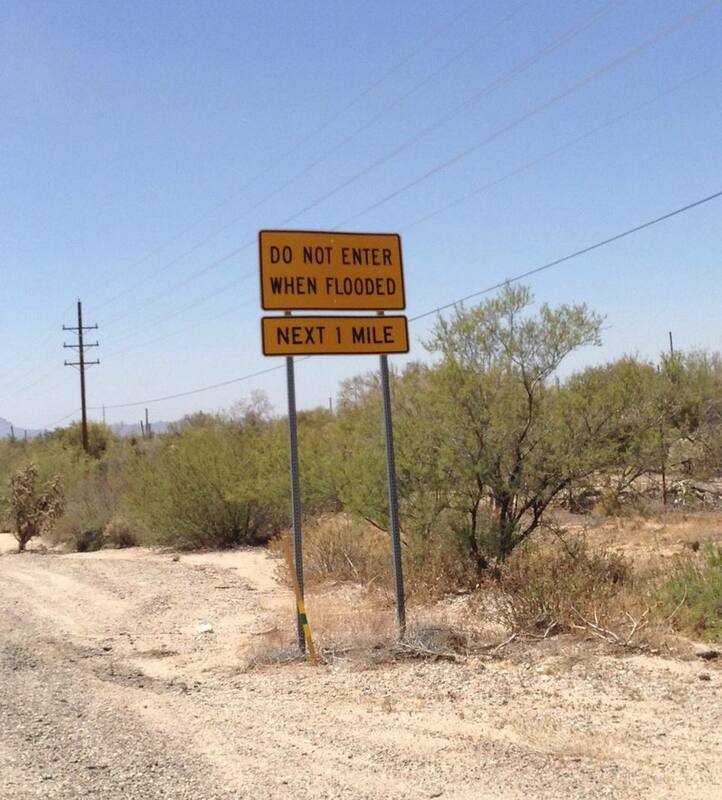 If you see a sign that says "Do Not Cross When Flooded," take it seriously. If you are caught in a wash, try to climb out on the roof of your vehicle and wait for help. Use your cell phone, if available, to call 911. If you're driving when it's raining, slow down. Remember that the beginning of rain storms in the area are the most dangerous times since that's when oils and other automotive fluids are being washed off the roads causing unusually slick conditions. If your visibility is impeded by heavy rain or blowing dust, most people will reduce their speed, but keep driving straight. Don't change lanes unless absolutely necessary. Area drivers will often use their emergency blinkers (hazard lights) during the storm because blinking lights are easier to see. If you don't want to drive in the storm, slowly pull off to the side of the road as far to the right as possible, turn off your car, turn off your lights, and keep your foot off the brake pedal. Otherwise, drivers may come up quickly behind you assuming that you're still in motion. To avoid being struck by lightning stay away from open fields, high land, trees, poles, other tall objects, standing bodies of water including swimming pools, and metal objects including golf clubs and lawn chairs. Turn off all unnecessary electrical equipment during storms to decrease the draw on power companies. This is a prime time for power outages in the area. Because of the risk of power failure, keep batteries, a working batter-powered radio or television, flashlights, and candles handy. If the power goes out, remember to keep lit candles out of direct drafts. Stay off the phone. Even cordless phones can cause a shock in cases of nearby lightning strikes. Use cellular phones for emergencies only. Stay away from plumbing fixtures including showers, baths, and sinks. Lightning can travel through metal pipes. Keep your distance from windows as high winds can blow heavy debris. While we spend most of the year in dry, warm weather, the Arizona monsoon offers a spectacular exception to that rule. It's that time of year when you won't hear area residents using the oft-used phrase "but, it's a dry heat."